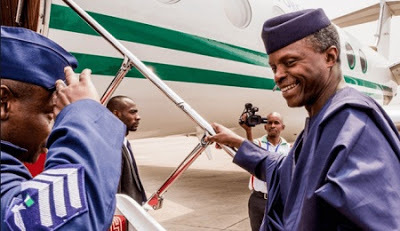 Osinbajo jets to Indonesia for EITI conference – Royal Times of Nigeria. The Vice President Yemi Osinbajo, SAN, has embarked on a two-day working visit to the Republic of Indonesia, during which he will address the opening plenary of the Extractive Industries Transparency Initiative (EITI) Beneficial Ownership Conference taking place in Jakarta, Indonesia, from Monday 23rd October to Tuesday 24th October, 2017. The Vice President, at the conference will speak on a range of issues concerning Nigeria’s extractive industry and general reforms embarked upon by the Buhari administration in the extractive sector of the economy, among other issues. Other world leaders and top government dignitaries speaking at the event include the President of Indonesia, Joko Widodo; Minister of National Development Planning in Indonesia, Bambang Brodjonegoro; EITI Chair, Fredrik Reinfeldt; among others.